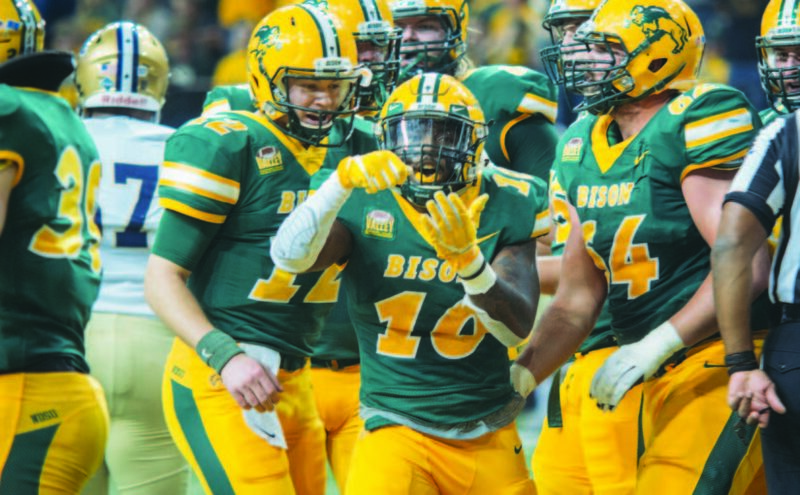 The Bison should keep feeding Lance Dunn (10) and the rest of the backfield after a seven touchdown performance. The second round of the FCS Playoffs offered intriguing matchups and narrow margins, but at the end of the day, the top eight teams lived to see another day. For the first time since the playoff field expanded in 2013, all eight seeded teams reached the quarterfinals. While questions swirled over whether or not the selection committee made the right choices, the top teams proved them right. As the field continues to shrink, so too does the margin for error. With the race for Frisco at a fever pitch, expect two things: the unexpected and seven more dogfights to crown a champion. Sure, Colgate was the No. 8 seed in the tournament, but by no means were they favored in their second round tilt with James Madison. Tied at 20 in the final seconds, Chris Puzzi banged home a 38-yard field goal to set the Raiders up for a Saturday morning date at the Fargodome. While Puzzi was the hero, it was Colgate’s swarming defense that made the difference. The Raiders picked off Dukes’ quarterback Ben DiNucci five times and easily could have won by a greater margin. Margin of victory is meaningless in December, as the Raiders are well aware. However, the Colgate offense was lackluster, which spells doom against NDSU. The Bison limited Montana State to three third-down conversions on 15 attempts. Meanwhile, Colgate went three-and-out four times against James Madison. If the Raiders cannot advance the ball, the Bison will have favorable field position and it will get dark early for Colgate. The Owls were fortunate to squeak by Wofford in the second round, narrowly winning by a 13-10 score. They’ll have their work cut out for them this Saturday when they host an SDSU team that dumped 51 points on Duquesne in the snow this past weekend. KSU’s low scoring output is alarming given the Owls averaged 53.5 points per game in the regular season. With the way the Jackrabbits are playing, KSU will need to return to their high-scoring ways. Taryn Christion may have posted one of his worst completion percentages of the season against Duquesne, but the four-year starter is one of the subdivision’s savviest men under center. The Owls counter with Chandler Burks, a Swiss Army knife at the helm of the offense. If the Jacks can throw Burks off his game, the rest of the KSU offense will crumble. It could be a shootout or a blowout in Georgia. Either way, it’s likely SDSU comes out on top and sets up a semifinal grudge match with the Bison. The Jackrabbits will likely make their second trip to Fargo this season for what could be the juiciest game of the year. SDSU lost the Dakota Marker, which only serves to fan the flames of the rivalry meeting. 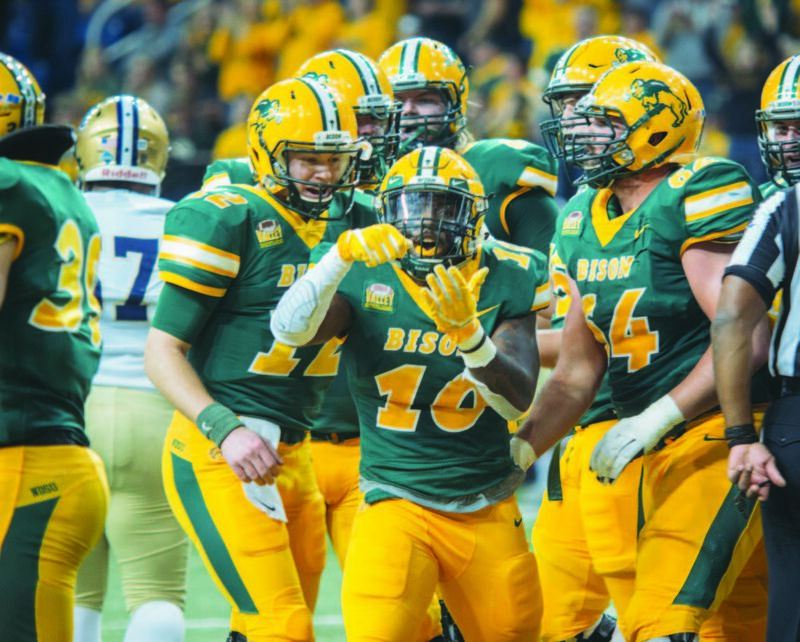 As it stands, it is NDSU versus the field, but the Jacks are better equipped than anyone else to give the Bison fits. SDSU was the only squad to truly give NDSU a run for its money, and they will do it again in the semifinals. Ultimately, with the home crowd behind them, the Bison will advance to their seventh trip to Frisco. No squad made a louder statement in the second round than Maine. The Black Bears scored three touchdowns in the first quarter to deliver a knockout punch to Jacksonville State. While the Gamecocks were a shell of the perennial power they are known to be, the Black Bears’ 55-27 win is no less impressive. Unfortunately, the Colonial Athletic Association champions drew the short straw with respect to travel. Maine will have to travel over 2,000 miles and cross multiple time zones for their contest in Ogden, Utah with Weber State. On top of that, they will run into one of the nation’s top defenses in the process. The Wildcat defense has allowed 21 points per game this season, while all three of Maine’s losses this season have come when they failed to reach that mark. The Black Bears’ quest to reach the semifinals for the first time in school history will have to wait another year. The final matchup of the quarterfinals features an all-Big Sky clash, as the Aggies and Eagles meet for the second time in 2018. UC Davis will hope to put up a far better showing than they did Nov. 10. EWU walloped the Aggies by a score of 59-20 in what was a top-five matchup at the time. Like Colgate, UC Davis should have won their second round matchup by a wider margin. The Aggies topped Northern Iowa by a touchdown, but failed to capitalize on either of Eli Dunne’s two interceptions or Austin Errthum’s two missed field goals. Truthfully, the Aggies were lucky to edge out the victory. It appeared as though EWU’s season was in peril when star quarterback Gage Gubrud’s season was cut short early in October due to a toe injury. Quite the opposite has been the case, as sophomore Eric Barriere has stepped in and lit up the scoreboard. The Eagles have the home field advantage and will move on to another Big Sky rendezvous with Weber State in the semis. The thought of seeing Weber State again is not a pleasing one for EWU fans. The Wildcats held the high-scoring Eagles to just six points in their regular season meeting and are more than capable of doing so again. Of course, that came in Barriere’s second career start, which was his worst outing of the season. What bodes well for the Eagles is that they shut out Weber State for the final 53 minutes of the game. It’s a difficult matchup to call, but the Wildcats have the edge.